TOM PENDERS "MR. MARCH" INSTITUTES A SUCCESSFUL Longhorn bASKETBALL “bOMBS AWAY rUNNING hORNS PRO STYLE OFFENSE” THAT REWRITES THE lONGHORN RECORD BOOK THAT ENDS A DECADE LATER WITH WITH Rumors of late-night phone calls to players, violations of federal privacy laws, and non-compliance on some NCAA rules. Lawsuits are filed but none of these allegations are Never proven and Penders lEAVES Texas. Coach Jody Conradt Was The Media Favorite For The Men's Basketball Coaching Job After Weltlich Was Released . When Asked By A Sport's Writer If She Was Interested In The Men's Basketball Job She Said With A Sense Of Humor "I Don't Need A Demotion." Texas Record Under Coach Penders Is 208-110. He Brings A Pro Style Running Game To The Longhorns And A Pressure Defense. The Era Of The "Runnin' Horns" Begins. This Offense Runs After Miss Shots, Turnovers, Time-Outs, And All Other Times. Penders Salary Exceeds $300,000 Which Is 10 Times What Lemmons Made In 1976, Three Times What Weltlich Made And 6 Times What Penders Earned At Rhode Island. Penders Came To Texas With Confidence And Stated "If I Can't Sell This Program, I Should Get Out Of The Business." One Elite 8 Appearacne With ("BMW" -Lance Blank, Travis Mays, And Joey Wright) These Three Are Considered As One Of The Best Scoring Machines In The History Of Texas Longhorn Basketball. Pender was the first Longhorn basketball coach in Texas History to deliver 4 consecutive 20 win seasons. Texas was 10th in the nation with the most wins over the last 4 years, and his teams were one of only 6 Division I schools to have 23 or more wins in each of the last four seasons. Second place in the conference in Penders first year . First NCAA appearance in 10 years. This team hold the Longhorn record for most points scored- 3205, and Most Personal Fouls - 783. Attendance At Games Reached A 10 Year High rising from 4,028 in 1987 to 10,011 Per Game in 1988. Mike Lacy, a graduate assistant coach, is hired to monitor the study hall for the players. The GPA increases from 1.9 to 2.4. The Horn basketball team is setting attendance records and getting great media coverage, but those responsible for ranking teams are not convinced the team is that good and will not place the Horns in the top 25. The biggest fear this year is that another university would hire Penders so the UT administration steps up and gives Penders a new 7 year contract worth $750,000 a year. The Horns have 11 - 100 point games. Penders Texas teams are on On National T.V. 5 Times. Blanks Is 3rd Leading Scorer In The SWC But Does Not Make The First Or Second Team All-SWC. Nolan Richards-The Coach Of Arkansas- Does Not Like A Referee's Decision In The Longhorn Game And Exits The Arena While The Game Is In Process. This Action is Tagged As The "Strollin' Nolan". Coach Penders Ask The Referee's To Call A Technical On Nolan But To No Avail. Arkansas Wins The Game. Nolan Strollin' Is At "6:38" In The Video Below. First time in Longhorn history the Horns make back to back NCAA tournament appearances. Coach gets a one-game suspension for critical statements about the SWC refs. Horns finish 2nd in conference play and barely get a NCAA bid. Travis Mays was SWC player of the year. Albert Burditt sets a record for blocked shots. Rumors surface that Penders will leave Texas for the professional ranks. Dexter Cambridge states that while in Junior College he received $7,000 from a booster, and he is temporarily suspended from the team. He says that $2400 of the money was payment for work and the difference was a bonus for a job well at Lon Morris college that was returned to Lon Morris after the impact on his NCAA eligibility was determined. NCAA accepts his explanation. Assistant Coach Jamie Ciampaglio is accused by the Travis County District Attorney's office of holding player's meal money on road games and other financial indiscretions. Ciampaglio resigns on May 8th 1992 and was convicted of a 3rd degree felony of tampering with governmental records. .
Texas plays LSU and Shaq O'Neal before 42,200 fans in the Superdome. Texas loses 84-83 in a very exciting game. Texas loses to Iowa in the NCAA tournament. IT WAS A TOUGH YEAR- injuries, ,academics, and NCAA rule changes took their toll on the season. B.J. Tyler and Al Segova are injured and struggle to return. Terrence Rencher receives a 2 game suspension, and Albert Burditt was dismissed from the team due to academics. NCAA reduces the number of scholarships from 14 to 13. Coach Pender eliminates his sons scholarship to comply with the rules. Tyler fails a drug test. The shot clock is reduced from 45 to 35 seconds. Team Finishes 7th in the SWC. In the Rice game Penders gets two technicals and is ejected from the game. Texas, Texas A & M, Baylor, and Texas Tech accept a deal to join the Big 12. The SWC dissolves two years later. After 19 years without winning the SWC tournament, Texas finally wins. B.J. Tyler was player of the year in the SWC. Rencher made the game look easy with his medium range jumpers and smart passes. Rencher recruited Texas instead of Texas recruiting him. He wanted to be a Longhorn since 1991. Rencher is the best scorer ever in the SWC averaging 20.8 points a game in 1994. 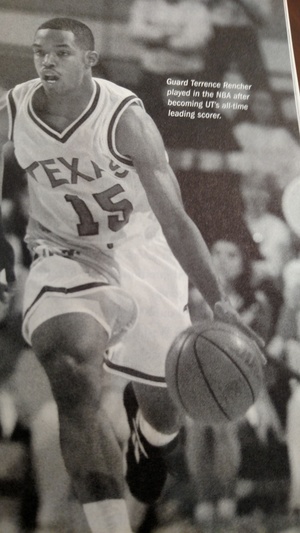 The other cornerstone for the 1994 team got to Texas circuitously. He starts with Angelina J.C. in Lufkin and impressed his coach and soon receives scholarship offers from Arkansas, Cincinnati, and Texas. He chose Texas and led the nation in steals. Tyler was selected by the Toronto Raptors in the 1995 expansion draft. According to journalist Chris Young's book Drive, Tyler accidentally fell asleep with a pack of ice on his ankle, causing severe nerve damage. Robbed of the speed that his game was based on, he was subsequently forced to retire. Texas losing streak against top 25 opponents increases to 13 in a row. Coach Penders son plays an important role for the longhorns during this season. 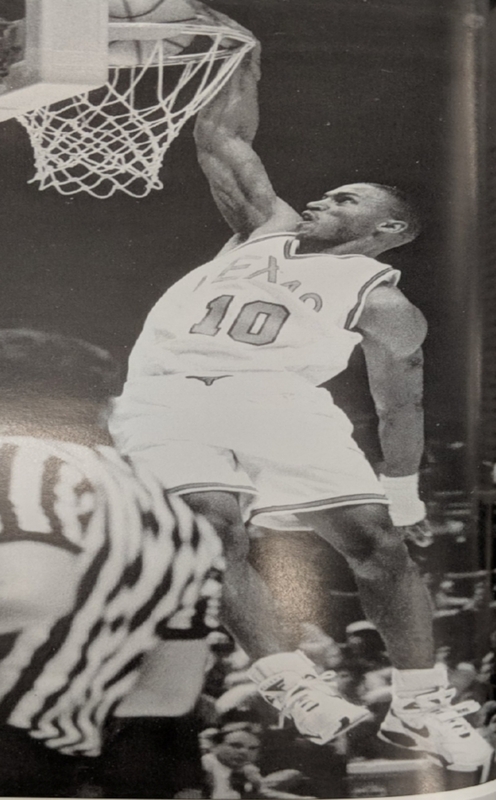 Terrence Rencher beats Travis Mays scoring record and finishes his career with 2,306 points making him both the school's and the SWC's All time career scorer as of 1994. Reggie Freeman 4th in career points. He is known as "Franchise". Texas beats UNC and Penders says it is his greatest win at Texas. Texas plays in front of 342,000 people this year. Coach Penders name is bantered about for other coaching jobs. A bad trend for college basketball begins. Players start leaving for the NBA after their first or second year at College. Penders gets two technicals and is ejected from the Illinois game. Randy Riggs from the Austin American Statesman express's concern that the Texas team has no leadership and the players shot selection is undisciplined. Four players (Axtell, Mihm, Muoneke,and Smith) tell AD Dodds they are not happy with Coach Penders and might transfer. Rumors spread of late-night phone calls to players, violations of federal privacy laws, and non-compliance on some NCAA rules. Lawsuits are filed but none of these allegations are ever proven and Penders settles with Texas. 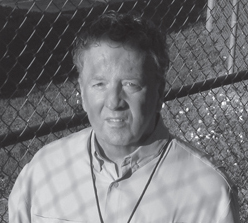 In 1997 Coach Penders is given a raise for his coaching skills and in 1998 he is fired. How could this happen so quickly? My guess is that Coach Penders health situation in 1998 is one of the main reasons for his quick demise. As of 1998 Tom Penders was either the first or second best Texas basketball coach in Longhorn history. He was a offensive genius with three of his players -Rencher, Mays, and Freeman- the top scores in the history of Texas basketball as of 1998. Many of the detractors of Penders were ready for the "next level" of coaching that Penders never reached at Texas. As great as he was, during his years at Texas his record against ranked teams was an anemic 10-44, and Arkansas dominated the Longhorns in the SWC. Rick Barnes is hired at $700,000 a year to help Longhorn basketball reach the next level.